Small Batch Chocolate Cherry Cookies are double chocolate cookies made with chocolate chips (or you can use chunks) and dried cherries. This version makes a little over a dozen. Don't preheat the oven yet because the dough needs a quick chill. In a small bowl, stir together flour, cocoa, baking powder, and salt; set aside. Place the 3/4 cup chocolate chips and butter in a large microwave-safe bowl. Heat on high for 30 seconds; stir and repeat until chocolate is melted. whisk in both sugars. If mixture seem very hot, let it cool for a few minutes, then stir in the egg. Stir in dry ingredients just until combined (do not overmix). 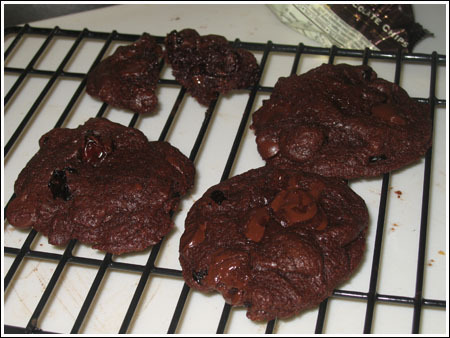 Fold in chocolate chips and cherries; press plastic wrap onto surface of dough and refrigerate 30 to 45 minutes. Preheat oven to 350. Line two baking sheets with parchment paper or non-stick foil. Drop well-rounded tablespoons of dough, about 2 inches apart, onto prepared sheets. Bake just until edges are firm -- 11 to 13 minutes. Cool on baking sheets 1 to 2 minutes; transfer to a wire rack to cool completely.